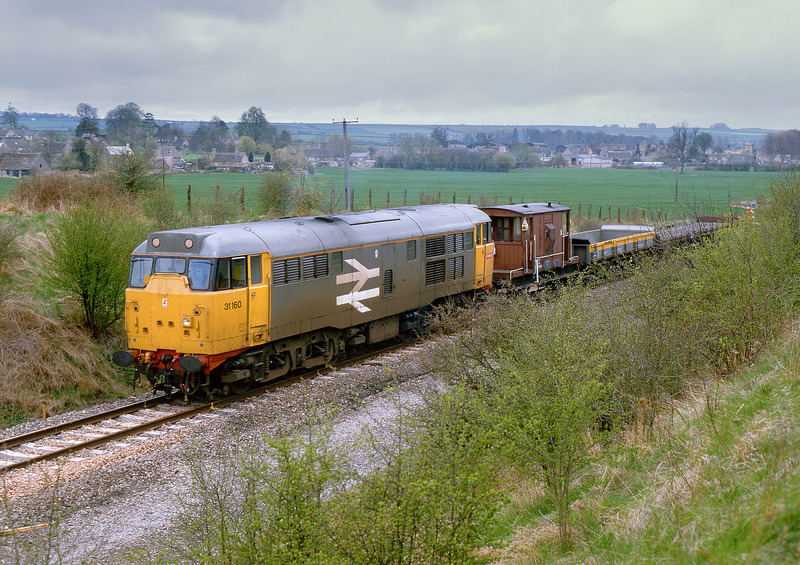 Under gloomy skies, 31160 waits in the engineering possession at Ascott-under-Wychwood on 4 May 1986. Although parked in a rather difficult position for photography, it does show the village of Ascott-under-Wychwood in the background, which is not normally visible in railway pictures taken from the more conventional viewpoints. Someone (possibly during the lengthy periods in the engineering occupations when nothing seems to be happening) has decided to start cleaning the large BR double arrow on the bodyside, but obviously lost interest half way through! Luckily the weather had improved by the time the train headed back to Oxford in the afternoon.